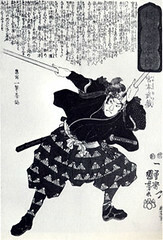 The samurai wore two swords thrust through the belt with the cutting edges upwards on the left side. The shorter, or companion sword, was carried at all times, and the longer sword worn only out of doors. From time to time there were rules governing the style and length of swords. Samurai carried to swords but other classes were allowed only one sword for protection against brigands on the roads between the towns. The samurai kept their short swords at their bedsides, and there were racks for long swords inside the vestibule of every samurai home.